Theodore Barcroft Lewis Moonemalle married long after his sister did, and his eldest daughter Lucille was exactly the same age as her youngest cousin, except for Brian, who was born in 2003 and died early in 2009. Lucille was born in 1900, as was my grandmother Esme. They both married Civil Servants, the latter Cyril Wickremesinghe, born in 1890, who was the first Sri Lankan Government Agent in what before him had been the exclusive preserve of Britishers. Lucille married Richard Aluwihare, who was five years younger than Cyril and who fought in the trenches during the First World War. His name still adorns, at the very top of the list, the plaque in Trinity College that commemorates the several Trinitians who fought for the Empire. Many of them died, though Sir Richard, as he later became, was one of the fortunate ones, and was able to tell stories in later life of the horrors of mud and blood and gas and shells he had experienced as a raw youngster. Cyril did not go to the War, though he had shone as a cadet at Royal. We still have a beautiful picture of his platoon, and I have often wondered whether any of that valiant group of innocents also went to war, and if any of them died. Cyril himself joined the Civil Service when he was just 21, and served in Kurunagala during the war, which is when I presume he met my grandmother. His mother, who had known her father in Galle, doubtless arranged things, though my grandmother never doubted that theirs was a wholly romantic affair. John Marcellus Lewis Moonemalle, one of my eight great-grand-fathers, was born I think in 1835. He died in 1887, at the age of 52. That is recorded on his tombstone. He was not at all distinguished, certainly not a patch on his father-in-law, John Graham Jayatilleke Hulugalle, who built up the fortunes of that side of the family, in Kurunagala, and died just five years before his son-in-law. John Marcellus was also overshadowed by his son-in-law, Edward Gregory Gunawardena. 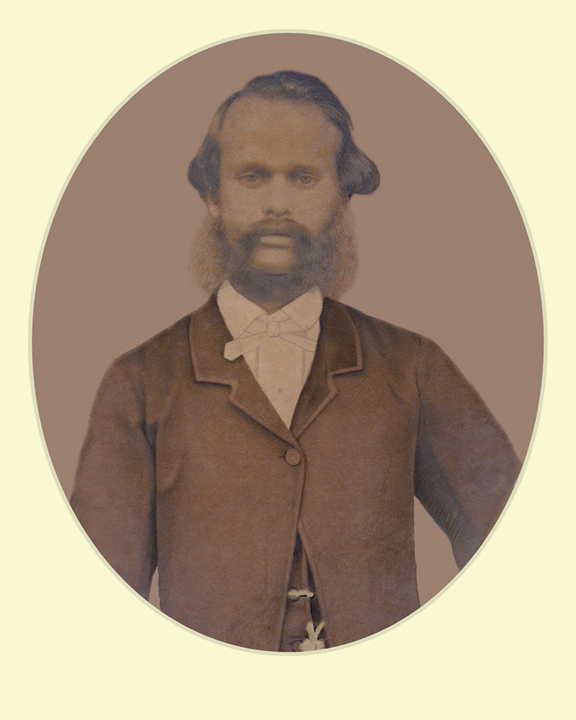 Born in Galle in 1858 and having enrolled as a proctor in the Galle Court at the age of 22, he transferred to Kurunagala five years later, when he married Ada Moonemalle. Their eldest child, a daughter, was born in 1886, so John Marcellus had the pleasure of seeing at least one grand-child before he died. His picture used to hang in the main drawing-room at Old Place, the mansion Edward Gregory built, where I spent many happy days as a child, and then as a young man, before it was sold. It was pulled down in the nineties, and on the site the Bank of Ceylon built a complex of buildings, including quarters for staff as well as an office. I visited the place some years back, and tried to work out where everything had been, the garage, the deep and frightening well, the outside storehouse for paddy, but everything had been built up and a clear perspective was not possible.